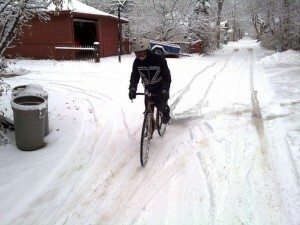 With the snow on the ground you may be thinking that riding a bike is done for this year. Or maybe you are already planning to keep riding but are still not sure of the best way to deal with the elements or maintaining your bike. Wear bright clothing with reflective strips or a reflective vest. Add a pair of reflective bands around your ankles and wrists. The ankle bands will always be in motion and the wrist bands will make your signals more visible. Equip your bike with LED lights both front and rear. Adding a solid white light (to light your path) on the front is a good option too. Add a reflector and/or reflective tape to your bike in case your light doesn’t work. Adding some reflective tape to the sides of your bike will also help to make you more visible from the side. Re-think your route. The route that you used all summer long might not be the best fit for the winter. Main arteries are plowed, but can become very slippery when polished up by heavy traffic. Of course you don’t want to have to be slogging through heavy snow either! Plan your route considering the conditions on that day, and allow extra time both to get dressed and for the ride itself. It is also a good idea to get to know the potential hazards along you routes as well. This can be very helpful especially when those potential hazards are not visible due to snow cover. Wear a balaclava, toque, mask, neck tube or combination to keep you head and face warm. Ski goggles are a great addition and generally don’t fog up like glasses. Tape over the vents on your helmet or add a helmet cover. There are also ski helmets and other helmet options that have less venting that work really well. Wear gloves or mitts that allow for some dexterity to operate your brakes. There are lots of options for your hands including pogies which attach to your bike handlebars and keep your hands from being exposed to the elements while still giving you access to your brakes and shifters. The wet sand and salt of winter are hard on your bike so you might want to consider an older bike. Beware of inexpensive department store bikes as the lower quality components are not meant for the extremes of winter riding. Whatever bike you chose needs to prepared and maintained so that it performs well under winter conditions. Check with your local bike shop or any of the community bike shops (see The WRENCH) for some advise and/or service. Consider converting your bike to a single speed (either a single fixed gear or simply using only 1 gear on your existing free wheel or cassette). Derailleurs seldom work for long under winter conditions without constant care and lubrication. Studded tires are not always necessary in winter, but there are times when they can be a great benefit, especially on the front wheel. There are a number of different types including some that bike shops make up themselves. Ou need to consider what the studs are made of as well as they may wear quickly on bare pavement. You might even consider making your own, but its best to talk to other winter cyclists before deciding which way to go. You want to consider traction, but also puncture resistance (who wants to change a flat in the cold) and rolling resistance. If you are considering a new bike or components, make sure to get the facts on the best options for winter riding. Options like sealed cartridge bearings can save you a lot of maintenance and reduce the potential for costly repairs. Narrower knobby tires tend to cut through the snow rather than float on top. Light lubricants specific to bicycles work best in colder temperatures. Never use solvents to clean your chain. In winter just wiping any build up off is sufficient. Make sure to wipe off the excess lubricant as it will only attract more salt and sand. Multi-gear systems will need to be cleaned more frequently. Make sure to lubricate all the moving parts on the derailleurs so that they continue to function. Rust is also a significant concern, especially in wet, sloppy conditions. Keeping your bike clean in winter can be a challenge. Brush away snow and ice from your brakes and drive train after each ride. Wipe your bike down regularly to reduce salt build-up. If the temperatures are such that you can wash your bike, bring it inside to dry off so the brakes and drive train components do not freeze up. Before you ride again, make sure to lubricate as indicated above. Riding a bike through winter results in the need for some extra attention to maintenance come spring. If you are even a little mechanically inclined you can learn to do most of the work yourself. Consider taking a course (see the links below) or use on-line resources to learn more about how to care for your bike. Bikes do not have to be disposable, just maintained. 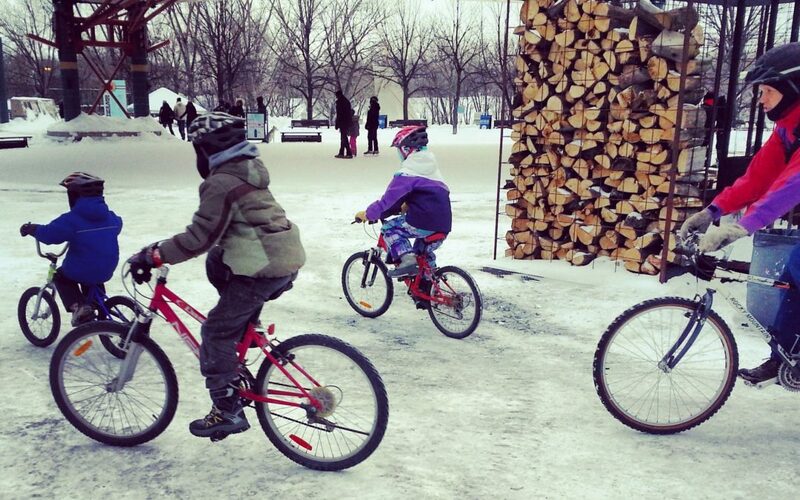 The Wrench, Bike Dump and Natural Cycle offer free winter riding and equipment workshops. Waterproof winter clothing and thick tire with spikes best for winter biking. I always bring an extra jacket on my backpack incase the temperature drops.. all in all, good tips. Excellent tips to ride biking in winter. Be that as it may, to be honest, I couldn’t care less about the climate condition. I additionally ride my bike all through the entire year, regardless of climate conditions. Winter can be a phenomenal time for cyclists to ride—the view is beautiful, the bugs are gone, and the snow is amusing to be near. Excellent winter bike riding tips for all bike rider. But to honest, I don’t care about the weather condition. Me and my dearest friend meet and riding planning to winter condition. But we know we all enjoy the journey. Thanks for lovely sharing. I always remember one thing ” you can know your limits while it’s tough out there”. So for me no matter what the weather conditions, I am ready to bike. As for plan & preparation, the route I want go plays a bigger role for me. from the past couple of months, I have been preparing for the winter season & I know for sure, it takes some extra time to figure it out but worth it at the end. Nice Share!!! I think it’s so better solution that you explain over the content above about winter riding. I havn’t ride bike with winter yet, but now I become clear some important issue with that content. Great post! During winter I love mountain bike riding and I never forget to take my first aid kit. Nice informative post. I think we should carry first aid kit as winter road are so slippy. I’m advising because I was slipped 3 times in one day. That’s why I suggest to carry first aid. A first aid kit may be a good idea. Personally I ride on studded tires and have not had an issue with falling. In the past I did ride on ordinary knobby tires and had a few minor falls. Studs certainly increase your confidence in slippery conditions. Excellent tips to ride biking in winter. But to be honest I don’t care about the weather condition.Because I am a college student & I use diamondback overdrive bike for this purpose. But wearing the cycling gear as per the weather situation to safe. Thanks! Great tips! I also ride my bike throughout the whole year, no matter the weather conditions. Winter can be a fantastic time for cyclists to ride—the scenery is beautiful, the bugs are gone, and the snow is fun to be around. However, like you said, when riding in extreme temperatures, proper plans and precautions need to be taken into consideration. Thanks! I might try winter biking for the first time this year! I live in an apartment and store my bike on a Gravity stand in my living room on top of carpet…anybody have ideas about how I would keep my whole apartment from getting wet and dirty as my bike melted off of snow at the end of the day? You may want to leave that summer bike on the stand and find yourself an old beater to ride through the winter. Bringing your bike inside all the time in winter can be very hard on your bike and its drive train components. If you have an old bike that can be locked up outside you will avoid the mess and the rust that will form quickly bringing it in all the time in winter. I hadn’t considered it could be better to leave the bike outside! I’m moving to a new place with a bike room in the basement which solves the dripping problem…but perhaps the best solution of all is a beater for outside-only. I’ve abandoned the car, living a 100% bicycle lifestyle. That includes 25km every day back and forth to work, no matter the weather or road conditions. Good advice in this article, and I have more at my blog. Winter riding uses more calories, so adjust. Also, allow more time for changing in and out of cycling clothes. Merino wool is outstanding for winter cycling. I swap my pedals out in the fall and spring. Studded tires are essential in urban Ontario, there is hidden ice here and there. I’ll be glad to answer any questions about winter commuting for those who are curious or contemplating giving it a try. Personally I ride a mountain bike but have adopted thinner tires than I started on. I agree that fenders are a must and in fact I add an extension at the bottom of my front fender to keep some of the spray off my feet.